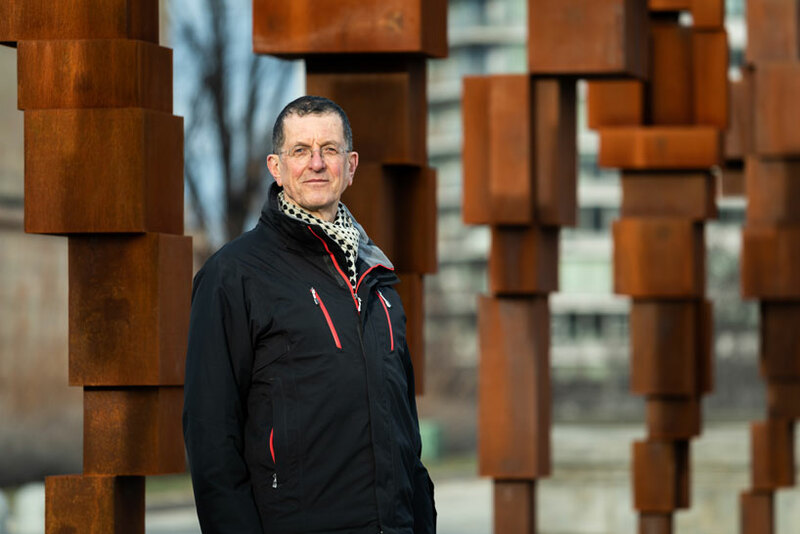 british sculptor antony gormley presents STAND, an installation of ten cast-iron blockworks, as a speculation on how public sculpture in an urban context can re-engage with the subjective feeling of the citizen. 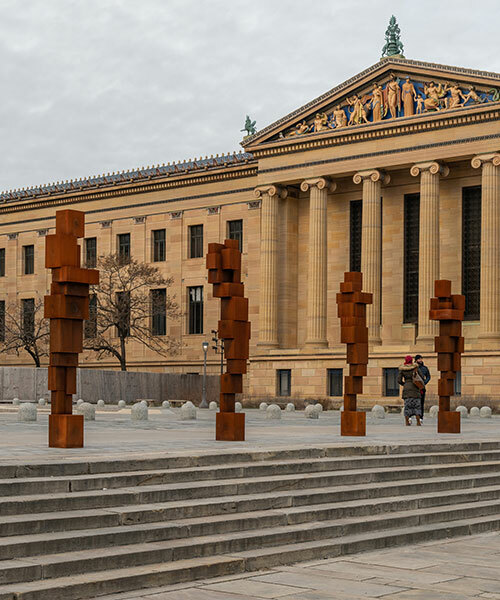 each rising ten feet high and weighing nearly three tons, the assemblage of figures is arrayed monumentally along the iconic steps of the philadelphia museum of art. while the series takes a symmetrical, forefrontal occupation along the axis of the grand neo-classical building, the figures are not traditional statues, or portraits of the moral and the great. they are not representative of a national era. rather, each abstracted figure invites the viewer to act as a ‘co-producer’ of the work, to both project and recognize internal affinities within the postural attitude it carries. 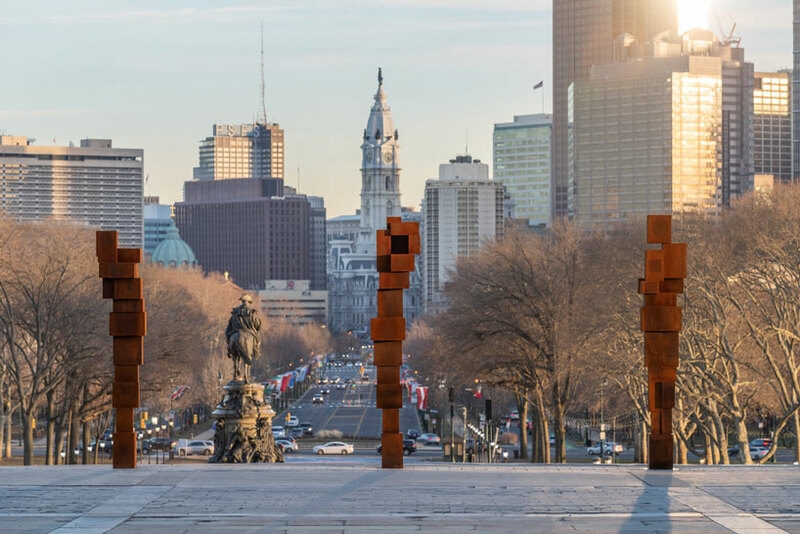 designboom was in attendance at the unveiling of STAND at the philadelphia museum of art and spoke with antony gormley regarding the significance of the work as an interface between the museum and urban context. 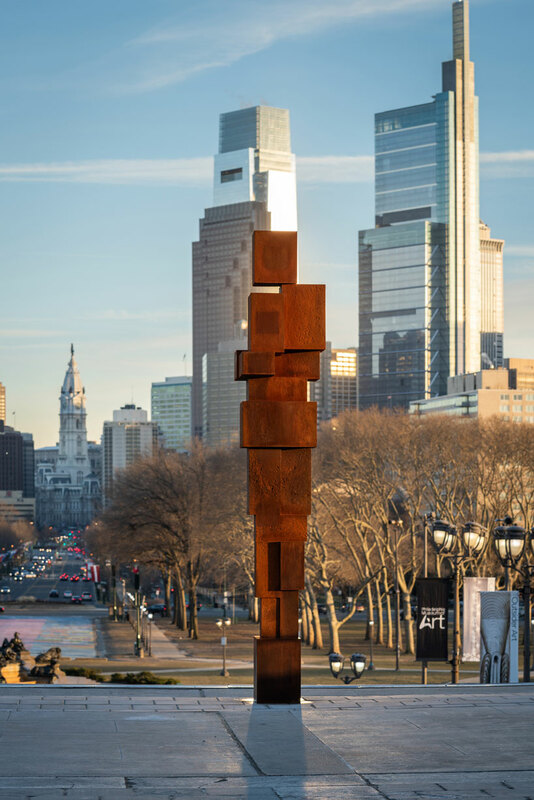 antony gormley’s STAND challenges the often alienating nature of large-scale public works. the artist notes that through the 20th century, public art did little to improve the nature and quality of collective space, which was being challenged primarily by cars and advertisements. 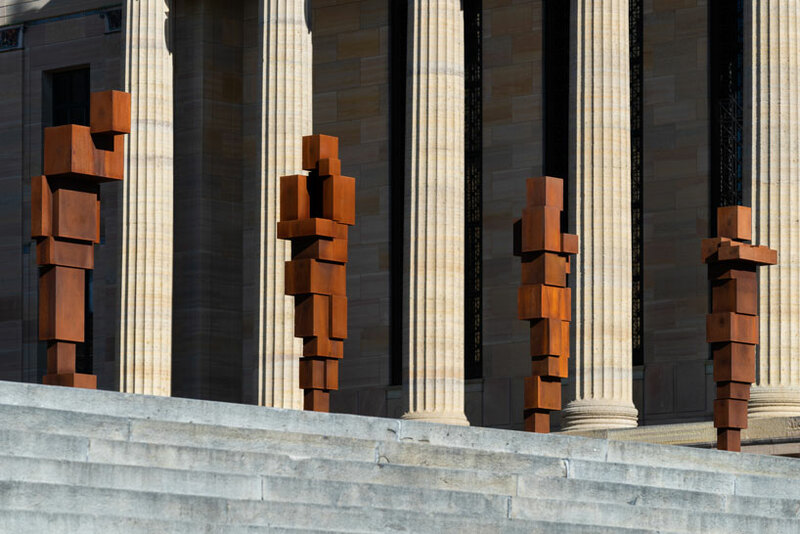 the figures, overlooking the steps of the philadelphia museum of art, are both ‘outside’ an institution and ‘with’ an institution. the work mediates the high cultural values represented by the historic building with the true social context of the streets of the city. regardless of their forefrontal position, the sculptures do not represent figural idealization, but self-reflection. the artist notes that the installation invites engagement from people who would perhaps never enter the museum itself. the postures of each figure were initially developed through the influence of such words as lull, daze, prop, and ponder. 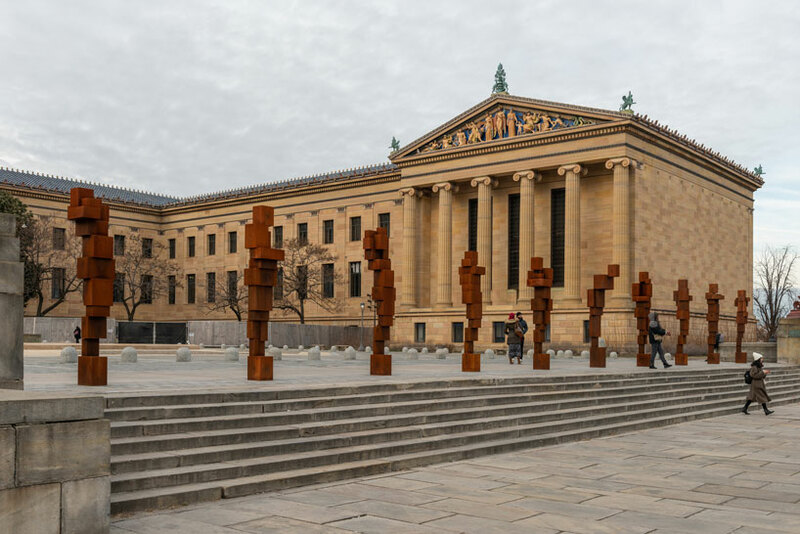 while each word served as a catalyst for formation during his creative process, gormley regards each figure as a sculptural rorschach test, inviting the viewer to generate their own translation. the works therefore have no meaning until there is a projected recognition from the viewer. the human likeness, or memetic factor of each figure is abstracted by the materiality and architectural language of the work. 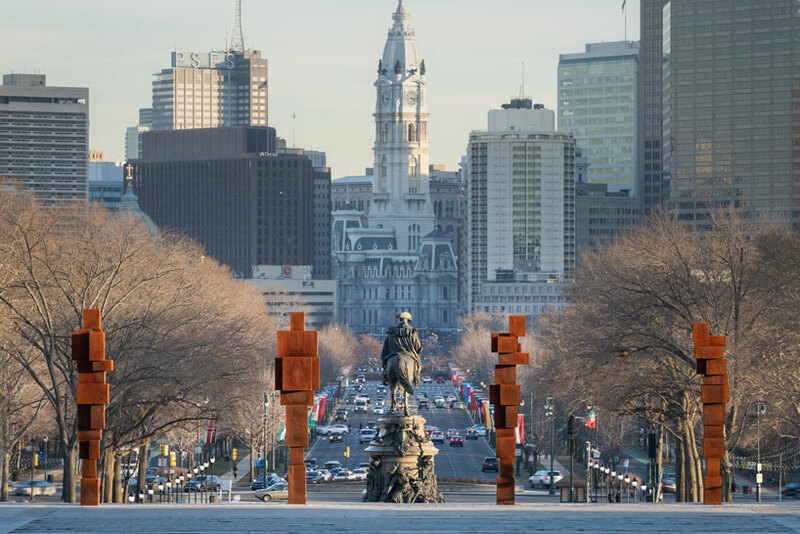 the installation will be on view from january 24th through june 16th, 2019 at the philadelphia museum of art, which is currently undergoing a transformative renovation by frank gehry.